It is difficult to believe that the spectacular wall paintings which adorn the Catherine Room were rediscovered only in 1965. 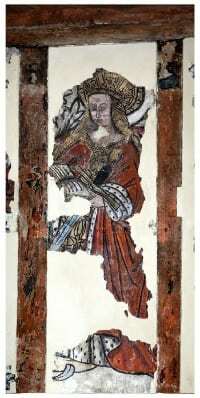 During reconstruction work on the College’s domestic buildings, the remains of a painted frieze appeared under the limewash on three walls of the fourteenth century first floor chamber at no. 2 The Cloisters. Preliminary cleaning revealed the figures of St John the Baptist, St Anthony and St Catherine set against an elaborate foliage background. In view of the significance of the find and the need for specialist treatment, the murals were protected by a temporary ceiling until conservation work could be carried out, which was undertaken subsequently in two phases: in 1991-92, by Wolfgang Gartner, and in 2003, by Ann Ballantyne. These once hidden treasures, believed to date from the late fifteenth and early sixteenth centuries, may now be enjoyed by all who visit the Catherine Room. Stylistic and pigment analysis of the paintings suggests that the south wall mural is earlier than those of the east and west walls. It depicts St John the Baptist, identified by the Lamb and Flag on a book, and, to his right, the Prince of Wales’ feathers through a crown. The background shows red and white roses on a trailing branch which then join together in an early version of the Tudor rose. Symbolising the union of the houses of York and Lancaster, the emblem indicates that the mural was painted circa 1486, the year that Henry VII married Elizabeth of York. The presence of the Prince of Wales’ feathers reinforces the conjectured date, linking it to the birth of Prince Arthur in 1486 or his investiture as Prince of Wales in 1490. The images on this wall are less sophisticated than the others, the figures appearing stiffer and the foliage details smaller and less elaborate than elsewhere in the room. The best preserved part of the frieze is on the eastern wall. Dominated by imagery relating to Katherine of Aragon, including her pomegranate emblem on the foliage background and the image of her patron saint, St Catherine of Alexandria, these paintings are thought to date from either 1509, to mark the marriage and coronation of Henry VIII, or 1511, to celebrate the birth of Henry VIII and Katherine of Aragon’s short-lived son, Henry. St Catherine is identified by the spiked wheel behind her and the shield to her left which bears her emblems, the wheel and the sword. Flemish in character, the carefully drawn facial features and sophisticated drapery demonstrate fine workmanship. The image of St Anthony of Egypt, believed to be one of the founders of Christian monasticism, can be seen on the left side of the wall. He is identified by a long staff surmounted by a tau (the Greek letter T), with his usual associate, a pig with a bell round its neck, and, above the pig, a shield bearing his cross with bell beneath. 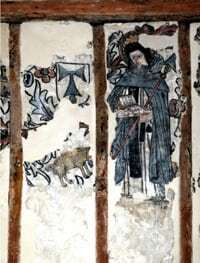 Of the west wall paintings, only parts of the foliage design and the head of a male figure, believed to be St George, remain. Surviving fragments show an armoured soldier with raised vizor, brandishing a sword in his right hand. The shield which might have confirmed his identity is missing. Nothing remains of the figure which is likely to have graced the north end of the west wall. Depictions of birds on this part of the frieze have led Ann Ballantyne to conjecture that it might have been St Francis of Assisi. To discover more about the Saints who appear on the Catherine Room frieze, where better to start than The Golden Legend, a collection of hagiographies composed in about 1260 by Jacobus de Voragine which became a medieval bestseller? 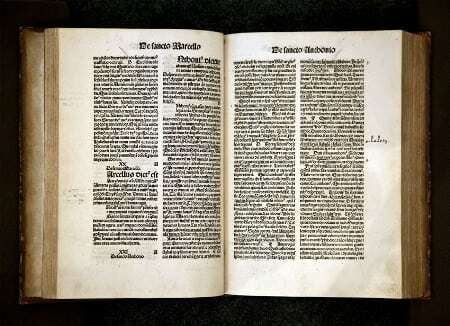 Numerous manuscript copies were made and, since the introduction of printing in the 1450s, countless editions have been published in Latin and in every other major European language. This Latin copy, printed in Strasbourg in 1496, is one of nine incunabula (books printed prior to 1501) held in the Chapter Library. It is open on the entry for St Anthony of Egypt.